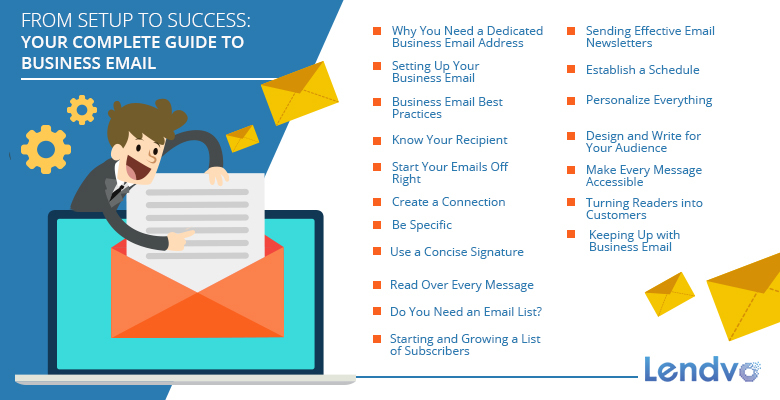 This guide will take you through every step of the process, showing you how to send professional emails to colleagues, provide value to your customers and grow your contact list for better business success. In the business world, branding is everything. Your brand defines your company and distinguishes its products and services from the competition. Customers equate brands with experiences and develop preferences based on the ability of brands to deliver on their promises. A business email address is part of your brand image. When a customer gets an email from you, what looks more professional? Your name stuck in front of a generic domain, or an address ending in a branded domain? Using your company name makes your messages appear more professional and gives a better first impression than sending from a site shared by millions of other users. A branded email address communicates at a glance where the message is coming from and separates your emails from the sea of 294 billion messages being sent every day. An email address with your company’s domain is also easier to remember. Customers are more likely to recall “[email protected]” than a generic address. When you maintain a consistent brand image across all channels, including email, it simplifies the communication process and facilitates conversations between your business and its customers. The best time to create a business email account is when you first set up your company’s website. If you already have a website in place, explore the email options offered by the hosting provider. If you’re still researching web hosts, look for one with generous storage space for messages and the option to set up multiple email inboxes. To make things easier on yourself and your customers, don’t create just one account for all your email communications. Set up multiple accounts with addresses like “[email protected],” “[email protected]” and “[email protected]” This gives customers a more direct point of contact for specific inquiries and separates messages into relevant inboxes. For every account you create, go into the settings and make sure the name displayed when emails are sent is a real name and not the email address. For your main contact, use your full name or the company name. Other accounts can be labeled with your company name and the purpose of the account, such as customer service. This makes the source of the message clear to recipients so that they don’t mistake important information for spam. Setting a display name also makes your business emails look more professional. When messages appear to be directly from you or a member of your team, it creates a feeling of connection between the recipient and your company and builds trust. Not every person sending an email to your company has visited your website first, so the combination of a branded address and a prominently labeled sender removes any chance of confusion about the correspondence. Setting up a business email address only benefits your company if you know how to write and communicate well with customers and other businesses. On average, people send and receive over 120 business emails every day, and 64 percent of people report experiencing problems resulting from misinterpretation of one or more of these messages. These statistics present a challenge to businesses striving to create and maintain a good image with branded email addresses. Messages need to not only stand out but also be clear and professional. Tone is difficult to master using text alone, but there are several best practices you can observe to improve the quality of your emails and prevent potential misunderstandings. Write emails with specific recipients in mind. What mindset are they in? Will they be reading the message when they’re on a break or skimming it on their phone as they rush from one task to another? Are you responding to a particular inquiry or request? Answering these questions will help you create more purposeful messages. Use a clear, professional subject line and a formal greeting to project a good image the moment a recipient sees your email. Keep the subject short and to the point, and address the recipient by name whenever possible. Avoid chatty or overly familiar language. Write an introduction after your greeting to make it clear who you are and why you’re writing. This section should be short and include only necessary information. If it’s your first time contacting someone, you may need to say a little more than when communicating with someone you met in person or have emailed before. Each email should include only one topic. If you have to contact someone about several different concerns, put each one in a separate message. This keeps emails short and helps prevent confusion. Remind email recipients how to get in touch with you by including your full name, your title or business name, your website, your phone number and any applicable social media links in the signature block of every message. Always proofread your emails, even if you’re only sending a few lines to a co-worker or adding a quick comment to an ongoing discussion. Typos and grammatical errors undermine your professional image and make it difficult to cultivate trust and respect with members of your network. Craft and send prompt replies with these guidelines in mind. Even if you don’t have time to give someone a full answer right away, send a quick note to let them know you got their message and will provide a more detailed response later on. This courtesy projects the professional and courteous attitude your colleagues and customers expect. Your business email address is useful for communicating with customers, co-workers, team members and other businesses, but it doesn’t help you reach a wider audience. For this, an email marketing list is much more effective. If your business sells products or provides services of any kind, you need an email list. It’s the best way to connect with large groups of people on a regular schedule. Collecting subscribers for a list grows your potential customer base and increases brand awareness. Each announcement, newsletter or offer you send reminds your audience of what they like about your company and steers them toward your website or social media accounts to interact and make purchases. Email marketing persists in an era dominated by an ever-increasing number of social media platforms because of its high level of effectiveness. Emails are five times more likely to be seen than Facebook posts, and email marketing is 40 times more effective at bringing in new customers than Facebook and Twitter. When an email campaign is properly designed and deployed, the ROI can be as much as 3800 percent. These impressive numbers show the potential growth an email list can bring to your company and make setup and management well worth the investment. Effective email marketing begins with using your business email address to sign up for a service such as Constant Contact, MailChimp or Aweber. These and other email marketing companies provide the tools necessary to build a list, create high-quality email campaigns, schedule messages and track results. After signing up for an account, familiarize yourself with how contacts are collected and managed. If you have an existing list of contacts, you should be able to import it in the form of a spreadsheet file. However, you can’t just duplicate your entire address book from your business email and start sending messages. Email marketing services require you to have permission from contacts before starting a marketing campaign. Some have a template email specifically for verifying this permission. Customize the email to let your current contacts know you’re setting up a list, and ask them to confirm their agreement to receive future communications. Send this email first to prevent any complaints about unauthorized messages. With a core group of contacts in place, it’s time to focus on growing you list. The best way to do this is through a signup form on your website and social media profiles. Create a simple, eye-catching form, and embed it in a prominent area of your website. Alternatively, you can create a pop-up or slide-in form using one of many popular plugins. These forms appear when visitors arrive on your site and can be timed to show up right away or after a short delay. You also have control over the pages on which the form appears. Test every form to ensure the information gets through and you don’t lose out on valuable leads. To post your form to social media, either copy and paste the links provided by your email marketing service or check Facebook for an integrated app. These apps can be installed as tabs on your business page, allowing you to attract and collect new subscribers without directing them to a separate signup form. Adding an incentive for signing up, such as a discount or a free download, improves your chances of capturing new leads. Wherever your form is posted, be sure to include a clear call to action. Tell potential subscribers what they get in exchange for signing up, and deliver on that promise with an automatic response sent as soon as their information is received by your email marketing service. If you choose not to include an incentive, make sure you still have a “welcome” email set to send immediately after someone signs up. This personalizes the experience and serves to remind customers to keep an eye on their inboxes for upcoming emails. Within the body of the message, the language can be slightly more conversational than your usual business communications. However, you should still strive for quality and brevity. Yours is the only newsletter arriving in customers’ inboxes, and they won’t give it priority unless it offers something of value and doesn’t take too long to read. Follow these four basic principles when writing to maximize the effectiveness of every marketing message. It’s common to send out a full business newsletter on the first day of the month containing upcoming events and pertinent information for the coming weeks. Special deals go out around the holidays, and you may have other occasional events to announce depending on your industry. Create a calendar to plan the frequency of your messages so that you don’t overwhelm customers with emails. Start each email with a personal greeting, and write emails with the goal of building relationships. Balance sales pitches and announcements with valuable content. Keep the lines of communication open by inviting readers to contact you with questions or feedback. Marketing emails have more complex formatting than standard business communications, and not every recipient will be able to view your newsletter as you intend to present it. Include a link to a browser version of all your newsletters so that the full effect is never lost. Add social media links to encourage sharing and bring your emails to a wider audience. Remember to provide the option to unsubscribe somewhere in every message you send. Most email services add this automatically to ensure compliance with spam regulations. Between market research, layout design and content creation, messages sent to your email list represent a significant investment of time. Such investments are only profitable if you wind up attracting new customers. To generate sales, make the content of your messages as actionable as possible. Most people tend to browse newsletters rather than reading every word, so use short paragraphs and concise language. Provide links back to your blog, website or social media profiles for readers who want more information. When you include an offer, emphasize it with a prominent link or button leading directly to a special landing page where it can be redeemed. The easier it is for interested readers to take action, the more likely they are to become paying customers. Your email marketing company should provide a way to automatically segment leads into different lists when they sign up. From there, you can choose which messages to send to which groups for the highest probability of conversions. Segmented lists allow you to apply specific forms of personalization to emails. Instead of simply sending out a newsletter of general interest to all email list participants, you can create messages to send in response to actions or on special days. These types of emails can offer 152 percent higher click-through rates and improve conversions by ten percent over other forms of email advertising. Practicing daily email management helps keep your inbox clear and reduces distractions so that you can focus on your regular work without worrying about messages piling up. It also helps you maintain the professional image projected with your business email address by ensuring you don’t neglect to reply to important communications. Providing timely responses to customers proves your brand is trustworthy, and this trust keeps them coming back to do business with you. Whether you’re writing to colleagues or customers, having a business email address improves your image in all communications. Once you’ve established your branded email account, use it to change the way you connect with others in your business circles. Create a positive first impression with customers and clients, and consider building an email list to reach a greater number of people. Following business email best practices in both internal messages and branded newsletters fosters strong connections. Keep your tone professional, always be courteous and stay on schedule with your replies to preserve valuable relationships in the long term. Managing email this way takes a little practice, but it becomes second nature in time and can bring many benefits to you company in the form of a bigger customer base, more conversions and increased ROI.